After a hot start to the Premier League season, the second round continued to deliver the goods with huge results for both Manchester clubs. It’s still early days but two consecutive losses for a number of teams sees them fall six points behind the league leaders, which includes Manchester City, Chelsea, Liverpool and … Watford? With some clubs already playing catchup, here are our winners and losers from the second round of Premier League action. It was a dark day for Huddersfield as Manchester City ran riot and found the back of the net six times at Etihad Stadium. Very few expected the Terriers to even salvage a draw in this game, but allowing the Cityzens to maintain 77 per cent possession is something David Wagner will be focussing on as they prepare to face new boys Cardiff. Aaron Mooy was sorely missed in the midfield as Huddersfield only managed 224 passes, while City more than tripled that number, finishing with 760 themselves. Sergio Aguero was the star of the show as he grabbed a hat-trick (more on him later), with Gabriel Jesus, David Silva and a Terence Kongolo own-goal securing the victory for Pep Guardiola’s side. While Jon Stankovic was able to pull one back just before halftime, there was no stopping the champions. After the 0-0 draw with Huddersfield at the end of last season, Guardiola was quick to make some tactical changes to ensure they didn’t get a repeat of the result. “We decided to play with two strikers to have more of a presence in the box, knowing we also have Mendy arriving. He is clever – he can see the pass in front of the ‘keeper, or the penalty spot, or the 18-yard box. He is a clever guy, arriving there. After scoring a double in Everton’s opening match against Wolves, Toffees fans felt a collective weight lift off the shoulders of Richarlison. The 21-year-old followed former Watford manager Marco Silva to the blue half of Merseyside and cost the club £40million. While there was plenty of potential in the Brazilian, few pundits expected him to live up to the hefty price tag so soon. His goal in the 31st minute against Southampton was enough to secure all three points for Everton in their first game at home for the season. The five-year deal has come under some critcism with the Brazilian only scoring five goals in 38 Premier League appearances last season. But Richarlison is now only two goals shy of that tally and is poised to be a serious threat for Everton as they push for a top-six finish for the first time since 2014. While Danny Ings goal in the 54th minute made for an interesting second half, Marco Silva was pleased with the overall result. “We deserved the three points. “It was important to give our fans some enjoyment. When the Premier League fixtures were announced for the 2018/19 season, a collective groan could be heard out of North London. Not only were Arsenal set to face the defending champions in the opening round of games, but there would be no rest for the weary as they travelled to face a new-look Chelsea side eager to make an impression. The results? Two games and two hard-fought losses. While the Gunners will say they did well to keep themselves in both contests, the Premier League ladder doesn’t lie. Both Chelsea and Manchester City are sitting at the top of the table with two wins from their opening fixtures, while the Gunners are now six points behind and sitting just outside the relegation zone. No, Arsenal aren’t going to be relegated. But falling behind the league leaders by two full games certainly won’t make Unai Emery’s first season in charge any easier. Goals from Alvaro Morata and Pedro inside the first 20 minutes gave the Gunners a hefty task, one which they admittedly tackled head first. Two goals inside the space of four minutes from Henrikh Mkhitaryan and Alex Iwobi brought the game level before a late winner from Marcos Alonso secured the win for the Blues. It’s the first time Arsenal have lost their first two games since 1992 and the Gunners have naturally had the critics’ spotlight on them, something which Mkhitaryan says isn’t necessarily deserved. “It has been a tough start of course – we faced two good teams in Man City and Chelsea – but you don’t have any easy opponents in this league. “We lost the first game and the second one as well. But that’s football. We just have to stay positive and continue working hard and the good results will come. With Huddersfield being the biggest loser of the weekend, their foil looks to be our biggest winner. Sergio Aguero notched the ninth hat-trick of his Premier League career against the Terriers. The Argentine scored his third in the 75th minute before being substituted for German youngster Leroy Sane. 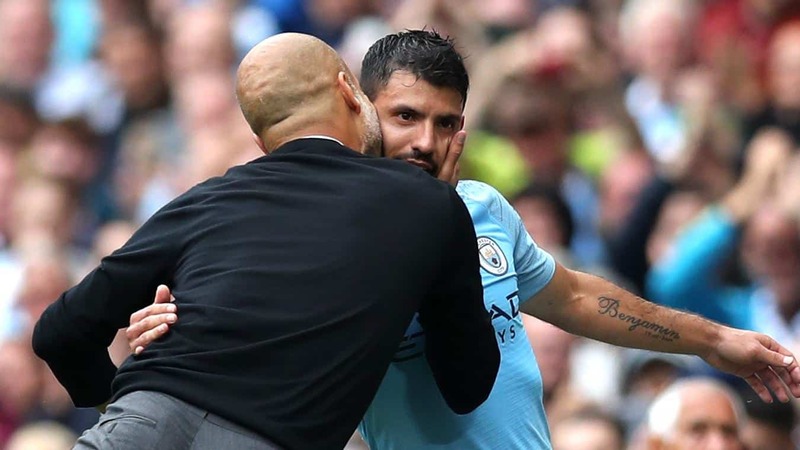 After missing 13 games last season due to injury, Pep Guardiola was pleased with Aguero’s strong start to the season. Another player returning from injury is World Cup winner Benjamin Mendy, who featured in just seven games last season thanks to an ACL injury. The 24-year-old only featured in one game in Russia, but has made a similarly impressive start to the season. The Frenchman set up Bernardo Silva who scored the winner against Arsenal before picking up another two assists in the 6-1 victory over the Terriers. The City manager was grateful to have a full-time left back at his disposal after alternating between Fabian Delph and Oleksandr Zinchenko for the majority of last season. The seeds were planted last week with a less-than-convincing performance against Leicester City and while Mourinho’s men came away with the victory at Old Trafford, their trip to the south of England brought about a substantially worse performance. United had just three shots on target throughout the entire game and relied on a Paul Pogba penalty deep into injury time to secure their second goal of the game. It’s a game that will surely put a strain on Mourinho’s relationship with the Red Devils executives as he’s been vocal about the lack of major signings. But the excuses need to stop from the “Special One” as losing to a team that were just seven points away from being relegated last season. This is all without even mentioning the strength of the current squad, one that boasts world-class talent across the pitch. Romelu Lukaku, Paul Pogba and David De Gea are just some of the names which featured in the loss against the Seagulls. After that, there’s a slight drop in talent with the likes of Anthony Martial, Eric Bailly and Fred filling out the rest of the spine of the team. Most other teams in the Premier League would love to have players of this calibre, yet Mourinho remains unhappy. “Obviously I wasn’t expecting big mistakes because we’re not speaking about small mistakes – we made big mistakes and we were punished by these big mistakes. Of course, when you lose your confidence, there is a normal tendency to lose a little bit the direction of the game plan. “We tried at half-time and the team tried in the second half, but I think from the mental point of view the accumulation of the mistakes and the punishing of those mistakes with goals step by step was giving happiness and confidence to a good team like Brighton. After scoring just one goal in 14 appearances last season, Danny Ings has made an impressive start to the 2018/19 Premier League season. The Englishman also featured in nine Premier League 2 games, but couldn’t find the back of the net. The 26-year-old has been hampered by injuries since 2015 with an ACL injury forcing him to miss 50 games for Liverpool and a subsequent knee operation sidelined him for an additional 35 games in 2016. Ings was a prolific scorer while at Burnley, netting 43 times in 130 games. The diminutive striker was signed by Mark Hughes for a season-long loan with the option to secure a permanent move for £20million. With the Saints barely escaping relegation last season and their attack leaning on an inconsistent Charlie Austin, Ings could be the injection of energy the team desperately needs. Miraculously, it’s just Ings’ second goal since April 2015 where he found the back of the net in a draw with Merseyside rivals Everton. But Mark Hughes believes that the Englishman can still have a substantial impact alongside Charlie Austin as the pair potentially leads the line together. “Danny looked sharp and could have scored in the first half but it’s actually a fantastic save having seen it since. I thought it was just a close-range miss but he’s actually saved it so credit to their keeper.